EUR/USD tried to make a comeback yesterday, following GBP/USD higher. But, while GBP/USD kept the bullish bias and is now more than 100 pips above yesterday’s lows, EUR/USD is pretty close to the lows and it has resumed the bearish trend. There are fundamental reasons for this, such as the problems with the Italian deficit for 2019, which I don’t think will go away for another week at least. Italian officials are hoping that economic growth will help reduce the deficit next year, but growth projections for the Italian economy are lower than what Italian politicians are suggesting, so the EU is set to reject the budget proposal. But there are also technical reasons for the bearish turnaround. As you can see from the H1 chart above, the 50 SMA (yellow) has been defining the downtrend for more than a week, since this forex pair resumed the bearish trend late last week. It has been pierced a couple of times, but the buyers haven’t been able to push too far above it and the price has returned below it again. 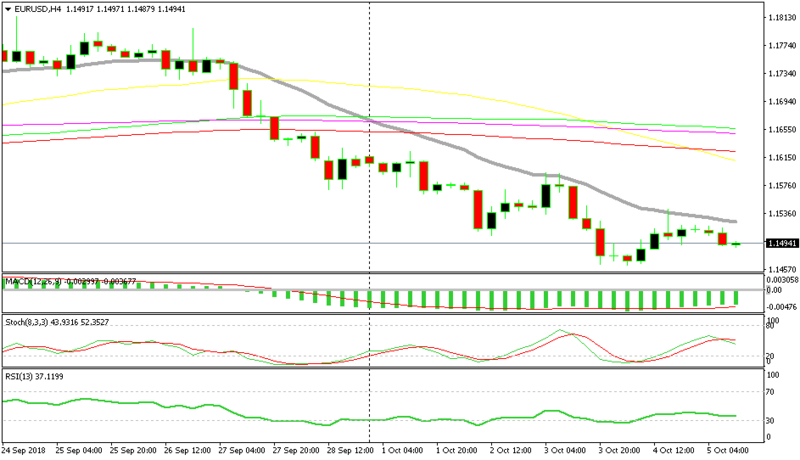 We can see that yesterday, EUR/USD turned bearish again after failing to properly break above the 50 SMA. Today, a similar scenario is happening. If we switch to the H4 chart time frame, we see another moving average do the job. We see that the price turned bearish after touching the 20 SMA and forming a doji up there, which is a great bearish reversing chart setup. The same thing happened yesterday, so it seems that moving averages are not letting this pair turn bullish. So, we are keeping the bearish bias for EUR/USD until the price moves above the 20 SMA on the H4 chart and the 50 SMA on the H1 chart.